Yvette Quintero, shown at right, is starring in José Adolfo Pichardo's play Nadís. Directed by Héctor Luis Rivera, the TEBA production is returning for a second run (due to popular demand) at the Broadway Blackbox Theater, located in the Washington Heights neighborhood of Manhattan. For more information, click here. 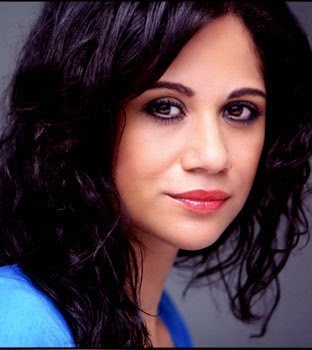 Emmanuelle Bordas shot a national Spanish-language commercial for Goya. Lorraine Rodríguez-Reyes just recently filmed another installment of "What Would You Do? ", a segment for "Primetime" (ABC), hosted by John Quiñones. Inma Heredia continues to present her self-penned solo show Divas de España (directed by Adolfo Vásquez). The show is being presented at Centro Español, located in Manhattan's West Village/Chelsea neighborhood. Luis Salgado will be directing and choreographing the musical Zuccotti Park (named after the NYC park that was the birthplace of the Occupy Wall Street movement). Written by Catherine Hurd (book and lyrics) and Vatrena King, the play will be presented in February and March as part of the 2015 Venus/Adonis Festival at 44o Studios, located in Manhattan's NoHo neighborhood. Casting is forthcoming. For more information, click here. Vivienne Jurado is starring in the film Dirty Shield (written and directed by Edgar Jimz). The film continues its run on the film festival circuit, with an upcoming screening at the 2015 Viva! Latino Film Festival International, scheduled to take place in February 2015 in New York City.